Wasa became very popular in my house last year. I was sent a huge box of them for my review and my parents fell in love with them! They were eating them for breakfast and using them in all different snack combinations. A few weeks ago, Wasa contacted me to review their crackers again and I happily agreed. There are 11 different kinds and they are all very delicious. Each flatbread contains around 30-45 calories each. They have around 2 grams of fiber each. I don't mind eating Wasa crackers plain but my favorite way to eat them is all jazzed up with fun toppings for healthy snacking. 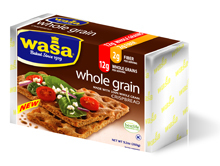 The giveaway will be for the 3 pack of Wasa crackers seen above to TWO lucky readers of The Nutritionist Reviews. The giveaway is open until Midnight on Tuesday August 23rd. Winner will be chosen on Wednesday August 24th using Random.org. The winner will have 48 hours to respond or a new winner will be chosen. **US only please! Tell me what you would top these Wasa crackers with for a healthy snack. -Like Wasa on Facebook (1 entry). -Write on the Wasa Facebook page that The Nutritionist Reviews sent you (2 entries). I would top these Wasa crackers with goat cheese! I would love to do a little bit of light cream cheese spread on it with cucumber and tomato slice. It may not be the "healthiest" but I usually add a bit of butter. SO good. In the fiber one giveaway. My Wasa Flatbread would have hot grilled chicken breasts with goat cheese in it. Yum! I would top it with lite cream cheese, a tomato slice and some basil. I'd top them with cream cheese and green olives. I "liked" Wasa on facebook. And I love Wasa crackers with cream cheese strawberries! These are my favorite! I eat them topped with a tuna/ low fat mayo mix and chopped green pepper! Peanut butter and banana on my wasa! I would top the cracker with a slice of tomato & a sprinkle of feta. I would make this cracker into a Bruschetta..some tomato, cilantro, onion and mozzarella! I like it simply with cottage cheese. Love it with hummus and cucumber! I'd top my crackers with cream cheese and homemade tomato preserves. Thanks. I love them with hummus and sliced tomato! would top these Wasa crackers with cheese for a healthy snack. I like Wasa on Facebook under Kayla P.
I'm a fan of yours on Facebook under Kayla P.
Hey! a piece of cheese and a slice of pear or apple would really make this healthy! I would top it with Avacado and salsa ! I would top them with string cheese. tomatoes, cheese, and basil! YUM! I will top the crackers with avacado and tomato's. entered the pretzel crisp giveaway! I would put edamame hummus on top! Maybe some basil pesto and tomato. maybe some cream cheese and pico de gallo. These would be delicious topped with a pineapple cream cheese spread. I am a fan of Wasa via Facebook as Jill Myrick. Christina - xristya@rock.com - Cream cheese and avocado! These are great with Hummus or cheese. I would top them with a little bit of spreadable cheese. I would top it with a little cheddar cheese and an apple slice. I'd either put cheese on them, or peanut butter and apple slices! I would top it with a slice of swiss cheese. I would place some just picked backyard tomatoes on these crackers! I would top them with some laughing cow and cucumber.